Chloe Gosselin with the Moonflower mask she designed to raise funds for Broadway Cares/Equity Fights AIDS. ﻿A white mask, no detail or adornment, designed to partially obscure the face. The Phantom of the Opera prop is a symbol as familiar to lovers of musical theater as Broadway itself. This year, the Andrew Lloyd Webber musical marks 30 years since its New York City debut, and in honor of that anniversary, the CFDA and Bank of America have joined forces to ask 30 fashion brands to put their own stamp on the Phantom’s mask. Chloe Gosselin, along with Edie Parker, Naeem Khan and Rebecca Minkoff, was among that number. Her design — the one-of-a-kind Moonflower mask — took a creative lead from her Fall/Winter 2018 collection and features the same surrealist dark floral print. The custom satin is decorated with approximately 260 Swarovski crystals in red, blue, blush and emerald and a vintage amber crystal flower with approximately 117 stones. The inside of the mask is lined in faux suede and signed by Chloe in gold ink. 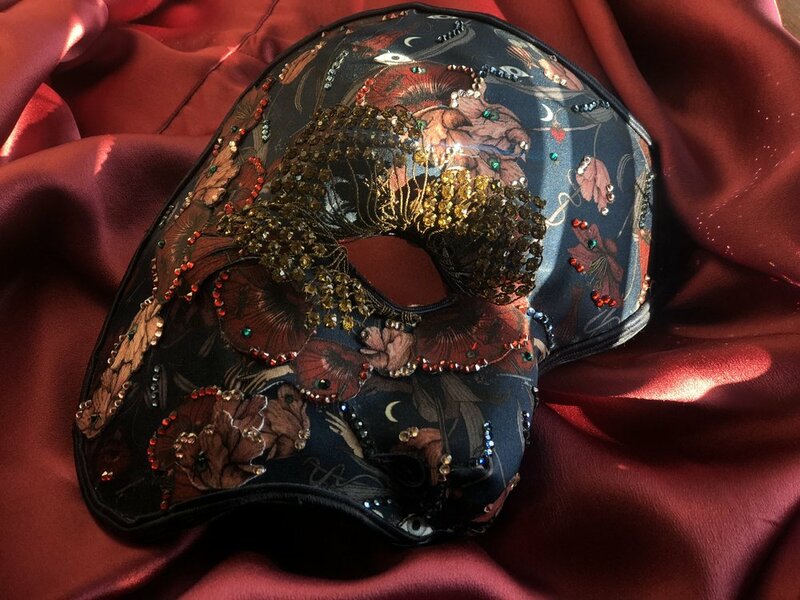 The mask is decorated with a surrealist dark floral satin, 260 Swarovski crystals and a vintage amber crystal flower. The mask, along with 29 other interpretations by American fashion brands, is now up for auction, with a guide price of $2,000. All proceeds will be donated to Broadway Cares/Equity Fights AIDS, which provides lifesaving medication, healthy meals, and emergency assistance across the US. 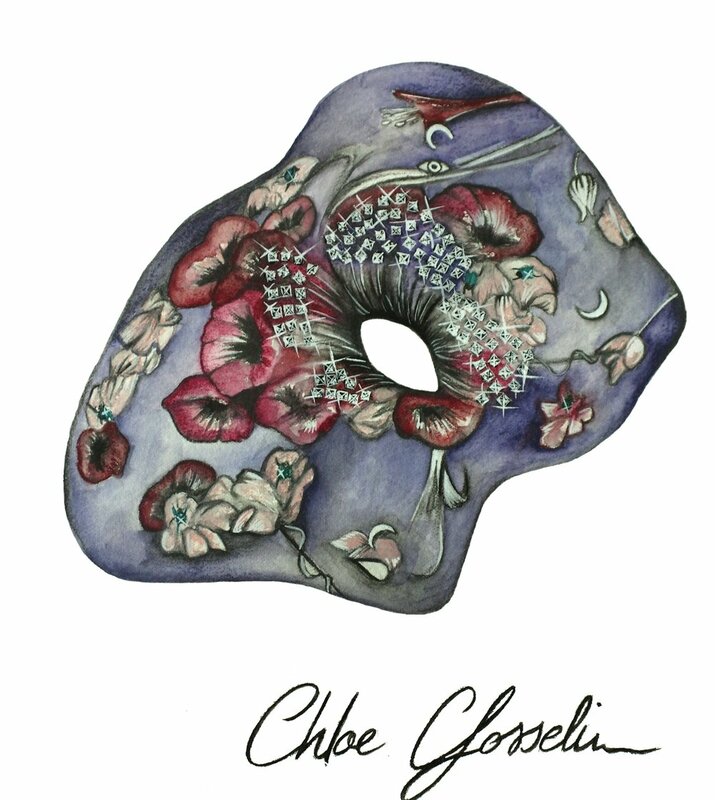 A sketch by Chloe of the mask she designed to mark 30 years since the Phantom of the Opera debuted on Broadway. Among the other designers taking part are Dennis Basso, Gigi Burris, Jana Matheson, Kenneth Cole, Marchesa, Nicole Miller, Pamella Roland, Sachin & Babi, Sally LaPointe, Stephen Dweck, Swarovski, Tadashi Shoji and Tanya Taylor. The masks will be on display at the Museum of the City of New York for the duration of the sale. To see all the designs and place bids online, visit the Paddle 8 auction here.